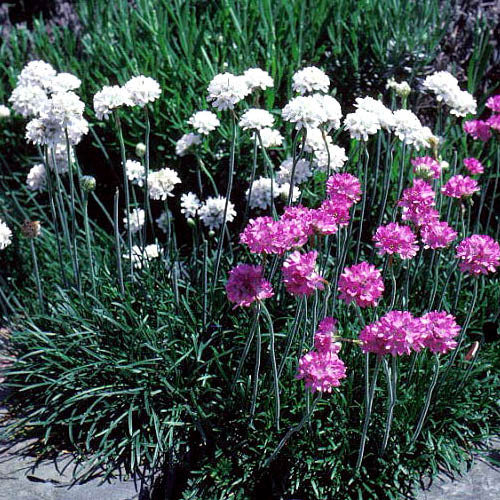 Small, mounded, grassy-leaved plants bear striking, rounded clusters of pink or white flowers on erect, wiry stems. Great for rock gardens and front of the border. Tolerates poor but well-drained soil. Requires very well drained (preferably sandy) soil. The centers may rot out in wet, humid conditions or in overly fertile soil. 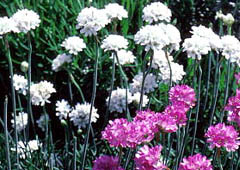 Most cultivars are pinkish or white, but some are purplish- or rose-red. Rounded flowerheads borne above the plant on erect, wiry stems. Propagate by seed, division or separation - Sow seeds where desired in the garden in fall. Different varieties hybridize freely. Divide in the autumn or spring. Deadhead. If the centers rot out, cut the plants back severely. Divide and replant only healthy plant sections, discarding the rotten center. Plants are evergreen. Do not prune in fall. Remove dead foliage in spring. �Alba�: 5-inch plants with cream colored flowers that are short-lived and easily damaged by weather. �Dusseldorf Pride�: Bright red flowers on 8-inch plants. Blooms from spring until late fall. �Merlin�: Pink flowers on short stems. �Rubrifolia�: Deep red flowers on plants with dark, almost black leaves. �Robusta�: Strong, 10- to 12-inch plants with 3-inch-wide heads of pink flowers. �Ruby Glow�: Deep red flowers on 8- to 10-inch plants. �Splendens�: Vivid red flowers on 8- to 10-inch plants. Striking. �Vindictive�: Bright pink flowers on 6-inch plants.